Constructed with poplar solids and rustic birch veneers in a hazelnut finish with ebony exteriors, this collection is the perfect selection for contemporary design that features luxury details and a rustic design influence. A great choice for anyone who adores the currently trending woodlands theme weddings, parties, and showers, the Kateri collection has the perfect amount of detail included in the sleek lined designs. With a variety of pieces to choose from for both the dining and bedroom settings, this collection has ample options and the perfect relaxing feel. With pieces for every room of your home, you can easily create the cozy feel you desire with these contemporary styles. With functional storage and stylish features built into each piece of the occasional and entertainment options, your living room is ready for movies, music, and more. Sleek black doors help conceal your entertainment boxes and game consoles while adding a surprise into the design that we love. The sleek slope to Kateri's headboard is by far the best design surprise from this collection. It brings a simple design to the next level and when it's paired with the natural beauty of the wood tones and finish details you'll love the look that it provides. Choose from two dresser options, two chest options, two nightstand options, and two bed options! You'll love all of the looks but create the perfect combination that's just right for your bedroom. When it comes to Kateri's Dining Room pieces our favorite, hands down, is the chinette. Take a look at the asymmetrical design and the unique combination of drawers and doors. With attention to details with lighting features, sleek glass doors, bronze bar pull hardware, and a built in wine rack, this dining piece is great for storage and display. This new collection On Display at Belfort Furniture is contemporary design that pays attention to modern needs. Attention to detail is key in today’s hectic world and the Kateri Collection includes features that provide the ultimate convenience in functional design while keeping a high-end style. 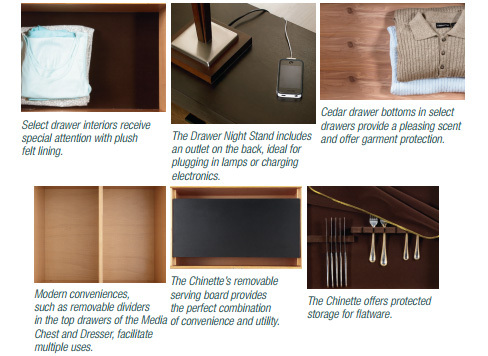 Key details include plush felt lining for select drawer interiors, built in outlets for lamps and electronics, cedar drawer bottoms in select drawers for pleasing scent and garment protection, removable dividers in media, chest, and dresser top drawers, a removable serving board, and protected flatware storage. View this Legacy Classic Collection in person, along with hundreds of other room settings, at our Dulles, Virginia Furniture Campus. As Washington’s Premier Furniture Mall our showrooms and galleries are filled with complete room settings and plenty of interior design inspiration.